As you know, there are two commodity exchanges in India – Multi Commodity Exchange (MCX) and National Commodity and Derivative Exchange (NCDEX). 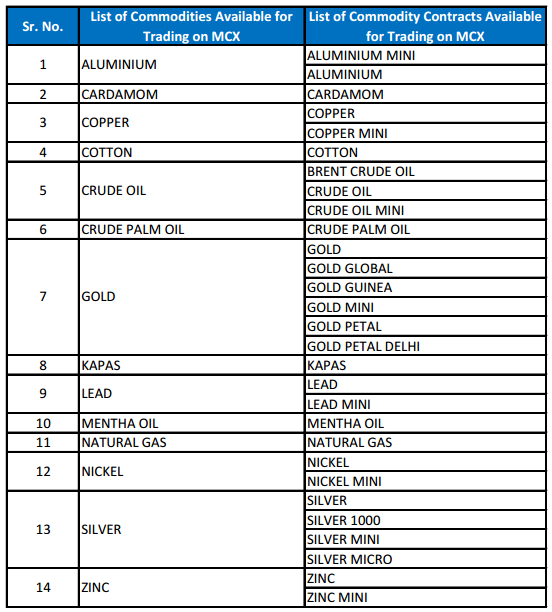 MCX is particularly popular for the Metals and Energy commodities while NCDEX for all the agri commodities. However, there is a lot of activity picking up on MCX for agri commodities as well. My job over the next few chapters is to discuss these commodities which are traded on the exchanges, and get you familiar with the commodity contracts. We will look into each and every commodity that is actively traded on the commodity exchanges. The idea is to know how the commodity contract works (contract specification), figure out which contract to trade, and identify the factor which influences the commodity. I will skip the usual background to commodities market part, the one which talks about the history, forwards markets, the farmers in US, the Chicago Mercantile Exchange etc. You will find this in almost any material on Commodity market. I would like get straight to the heart of the topic by slicing and dicing the contract specifications of commodities and other details around them. The idea is to cover all the major commodities that one can trade. Needless to say, one has to know how ‘Derivative Futures’ function before attempting to understand Commodities. So if you are not familiar with Futures, I’d encourage you to read the module on futures trading. Anyway, assuming you are familiar with Futures, we will now start with Gold. Gold is a very actively traded contract in MCX. It has ample liquidity, with daily trades of roughly 15,000 contracts translating to a Rupee value of over 4500 Crore. Note, these numbers belong to just one type of Gold contract, often nicknamed “Big Gold”. All these variants belong to the same underlying i.e Gold. I guess the best way to understand the difference is by understanding the contract specification of each of these variants. We will start with the big boy first, i.e ‘The Gold’. Let me discuss these details in the same sequential order, so that it becomes easy for you to understand the subsequent contracts. We’ll start with the price quotation. As you can see the margin percentage is just about 4%, which is pretty much similar to the currency contracts. However, the Rupee value of the margin is way too high and it therefore prohibits many retail traders to initiate positions in Gold. In fact, this is the reason we have contracts like Gold Mini and Gold Petal, where the Rupee value of the margins is lower. We will talk about these contracts a little later. Needless to say, the most recent contract is the most liquid contract to trade; in this case it would be October 2016 contract. Now when the October 2016 contract expires on 5th Oct 2016, September 2017 contract will be introduced, and the most active contract from 5th Oct 2016 would now be the December 2016 contract. Do recall, settlement in equities is always in cash and not physical. However, when it comes to commodities the settlement is physical and therefore ‘delivery’ is compulsorily. This means if you hold 10 lots of gold and you opt for delivery then you will get 10 kg of gold. In order to get the delivery of the commodity, one has to express his intention to do so. This has to be done any time before 4 days to expiry. So given that the expiry is on 5th, one has to express his intent to take delivery anytime on or before the 4th (1st, 2nd, 3rd, 4th). If you are trading with Zerodha then do note, we do not allow you to get into the physical delivery of commodities. So you will be forced to close the position before 1st of the expiry month. In fact, I personally prefer to close the positions early on and not really get into the physical delivery of commodities. For all practical purposes if you know these things about the Gold contract, you pretty much know what is really required before you trade the big Gold contract. We will now move on to know the other variants of gold that gets traded on the exchange. The big gold contract as you realize demands a heavy margin requirement in terms of Rupee value. This prevents a lot of traders from trading the big gold contract and perhaps this is the reason the exchanges introduced contracts with much lesser margin requirement. I’m assuming the table above is a lot easier to understand now considering we have discussed these details earlier. Let’s dig straight into the margin details. Beyond the Gold Mini contract, we have Gold Guinea and Gold Petal contract. These are extremely tiny contracts which demand a very low margin, as low as Rs.1251 (Gold Guinea) and Rs.154 (Gold Petal). The lot size is small and therefore the contract value is small as well. You will find few variants like Gold Petal (Delhi), Gold Guinea (Ahmadabad) etc., I would suggest you ignore these, especially if you idea is to just trade Gold. The number of lots in Gold Petal should not entice you believe that the liquidity is high, do remember Gold Petal lot size is just 8 grams, and therefore 8-9K lots translates to roughly 2-2.5 Crs. Another important thing to note – liquidity is highest in the most nearest month contract, so always stick to these. The thumb rule here is – farther the contract expiry, lower is the liquidity. With this, I assume you are familiar with the Gold contracts and the logistics. In the next chapter we will discuss few interesting topics such as the parity in domestic and International gold contracts, factors influencing Gold, relationship between gold, equities, and dollar etc. Gold is one of the most popular bullion contracts that gets traded on MCX. 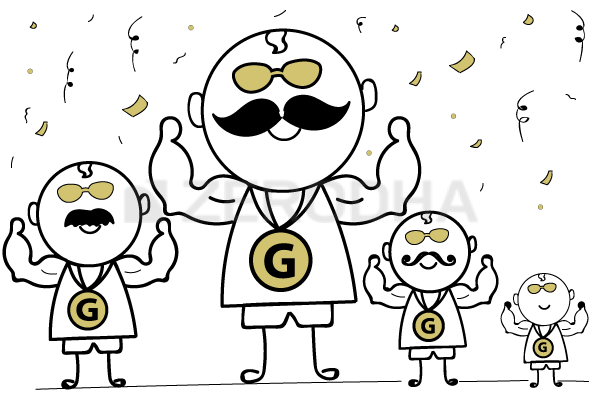 Gold contract comes in a few variants – Big Gold, Gold Mini, Gold Guinea, and Gold Petal. Big Gold is the most popular contract, but requires a margin in excess of Rs.1,25,000/-. The P&L per tick for the big Gold is Rs.100. P&L per tick can be calculated as = (Lot Size / Quotation) * Tick Size. Gold Mini is the 2nd most popular Gold contract, requires a margin of roughly 15K. Gold Petal and Guinea are other variants demanding much lower margin requirement. However the liquidity in these contracts is quite low. It is always a good idea to stick to the nearest month contract as liquidity is high in these contracts. Delivery is compulsory for all these contracts; therefore it makes sense to close these contracts at least 4 days before the expiry of the contract. Gold petal lot size 8gm or 1gm ? Right after the chapter on Gold & Silver. How can I invest in Gold? Like If I want to invest in SBIN I simply buy 1 share of SBIN by CNC trade. How to buy Gold by CNC trade? Gold and Crude has to be the most active commodities in India. They trade from 10:00 AM to about 11:30PM. Most of the international currency pairs trade 24/7. I wish to trade Gold mini futures. What is the market timing in India to trade this?. example ..Stock market opens at 9.15 a.m and closes at 3.30 p.m. beyond which we cannot trade..similarly is there any timing for commodity market? 10 am to 11.30 PM. @Kartik, when the tioic on crude oil will be posted. Eagerly waiting. Right after topics on Gold and Silver! 10:00 AM to 11:30 PM. I have an account in Zerodha since last 4 years. But Commodity transactions is not active. What to do for that. Is there any separate charges for that? Can we trade commodities in kite ? Are there separate yearly charges for mainting commodity account? Please Post Crude related article at the earliest. We will post chapters on Crude soon. You need to open your commodity account to trade commodities. Suggest you contact our sales team for that. Yes, you can trade commodities via Kite. Thank you, and wishing you and family the same! Hi Karthik,great work by you and your team I have gone through all modules, excellent work!! . 4) Simple TA works like a charm, give it a try. Thanks for your reply,But i don’t understand what is TA ? Please explain and provide some links to learn them. ( Now when the October 2016 contract expires on 5th Oct 2016, September 2017 contract will be introduced….). In this sentence isn’t the month should be October 2017 that is 2 months after August 2017 as mentioned on the Table ? Sumeet – Thanks for pointing out, I may have mixed up the dates. Yes, you can short the contract, carry forward the same, and close it before the expiry. Was looking at the GoldM contracts. When I look at it in the Margin Calculator in the ‘Net Qty’, I see 100 (Lot Size). But, when I try to trade it; the qty says ‘1’. Does that mean 1=100, so the tick is Rs 100? Similar is the case with SilverM. Yes, 1 refers to the multiplier. hi sir i dont have clarity on mcx contract expiry dates can u guide me what is best option to do commodity trading intraday or carry forward contract.when i need to exit before expiry or wait till expiry, i am also confused about physical delivery. i have read somewhere if u dont close ur contract it will goes to physical delivery what is that , what is warehouse receipt? Most of the thing you’ve asked is explained in the chapter itself. I’d suggest you close the position before expiry. Intraday or swing trade really depends on your risk appetite. Thanks for the kind words, Manish. MCX gives out that chart, I had a copy of the same (need to dig up)…will try and put that up sometime soon. I want to take delivery of gold petal in demat. How can I do so..? You cannot do this. However, you can take delivery of Goldbees, which is basically an ETF based on gold prices. I have read your pdfs’ and I am simply mesmerized by the way you have written down the content comparing it with routine life along with the graphs. I have opened the account in zerodha. I am pursuing MBA and very much interested in capital markets. Actually we are 3 friends and I would like to know if there is any project for us or any internship opportunity under your guidance. Hoping to learn from your experience and knowledge. Thanks for the kind words, Mohit. I’d suggest you reach out to our HR to know if there are any opportunities in Zerodha. when i type gold in kite it shows gold fut contracts, how do i get the gold spot chart??? Gold spot is not traded on MCX, hence the chart is not available on Kite. then form where can i get the chart to analyse the longer time frame data? YOu can always check the futures chart. so you mean to say that GOLD M August fut contract will expire on 5th of august? Not sure of the date, but yes, the contract will expire on the designated expiry date. Dear sir, I am member of zerodha and at present trading on equities only. Sir in this chapter you have given a table for Gold Mini, Gold Guinea and Gold Petal in that in Delievery Logic you stated as Compulsory. Please clarify whether in these delievery is compulsory and it can not closed for cash. You can close for cash if you decide to square off the position before expiry. what are the timings of commodity market? 10.00 AM to 11.30 PM (up to 11:55 P.M. on account of day light savings typically between every November and March of the following year) for all Non-Agri commodities. 10.00 AM to 5.00 PM for other Agri commodities. sir, when i am writing gold on search box it shows copperm aug future. Then how i trade on gold commodity? 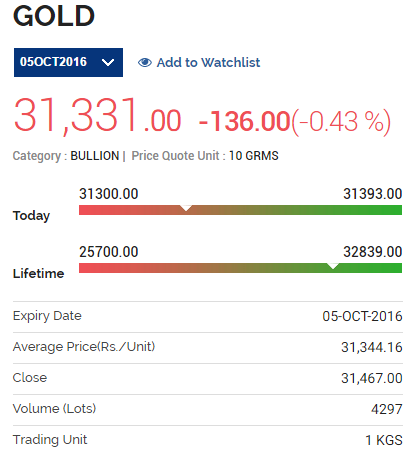 Look for ‘Gold MCX’ on the market watch in Kite. You will find the futures contract. Good luck! Sir, what is a Bullion contract? Bullion is nothing but Gold. why you are not allowing delivery of gold in demat form. You said that delivery of gold contract is compulsory if position is not squared off. if for some reason the trade cannot be squared off , what will happen then. It will be treated as an expression of interest to take delivery. Similarly if someone has shorted say gold and not squared off till expiry then he had to make delivery of gold. Is it so? Also if the position is squared off even in expiry day then there would be no settlement issue or position should be squared off before 1st of expiry month. You need to deliver 995 purity(or higher) Gold to the MCX vault who will, in turn, give it to the buyer of the contract. Failure to provide delivery will lead to a cash settlement with a penalty of 3% of the contract value on expiry (or more if the gold price has moved up). The MCX contract specification has more on this. Firstly I would like to thank You for this amazing job of educating the public you’re doing. It is truly magnificent! I have a question for which I would greatly appreciate your input. I tried calculating the Option Greeks for Commodities on the Black – Scholes Model. However, the MCX website does not provide the Implied Volatility column. Is there any other way to calculate the same for the Commodities? Good luck to you too, Lalit! i also want to trade agri commodities in ncdex .Will you advise me of any good broker which would provid eme trading in ncdex. I’m not sure, Anulekh. Btw, why do you want to trade agri commodities? Do you understand them better? I think that in some cases their demand and supply could be understood better and that they can move by more percentage as compared to stocks which could result in higher gain if our direction is correct.Am i right?whtas your view on agri commodities. I am new to commodity tading.I bought goldm 19 feb futures on 28.1.18 ,but i recived message to squre off my holding on 31.1.18 before 11.00a.m. pls let me know the expiry date of the contract. I guess these are physically settled, better to rollover the contract. Now when the October 2016 contract expires on 5th Oct 2016, September 2017 contract will be introduced, and the most active contract from 5th Oct 2016 would now be the December 2016 contract. Just noticed that the above should be corrected. The new contract introduced will be October 17. Am I right sir? Ah, thats a mix-up. Will plug that in. No worries sir. Always you’re the best!!!! Sir what is the “delivery unit” in the contract specification ? That is the unit size of the commodity, that you will be obligated to take delivery upon expiry. So if I buy 1 contract of gold petal, will I get 8 grams of gold upon physical settlement. The contract lot size itself is 1 gram. You will have to pay the money equivalent to 8Gms. To be clear, you mean I cannot physically settle 1 contract but have to buy/sell. 8 contracts if I wish to go with physical settlement. Am I understanding right sir? No, each contract has a delivery size of 8 grams of Gold petal. That’s what I meant. Lot Size is the tradable quantity on the exchange while the delivery unit is the minimum quantity(in multiple) you can opt for physical delivery. Since it is not feasible to delivery 1 gm of Gold, Gold Petal carries a delivery unit of 8 grams. If you have a lower quantity, it will be cash settled. Let me know the process for gold etf. You buy it just like any other stock on Kite, Harsh! Is physical settlement is same for other metals also like that of gold. Fr Eg: Aluminium. When we have to square off the position if settlement is on 19th. What will be the case if we have a arbitrage position. say short of 1 lot of mega and long of 5 lot of mini. What will happen in such cases if we didnt square off before 5 days of expiry. Its best you square off the position for the delivery period starts, Rashid. Else you will have to take the pains to go through the delivery process and the arbitrage opportunity may not exist. I am new to Commodity Trading. Your Answers are really very helpful in my learning. 1. Is there any max. limit or max. quantity one can hold ? Say for Example Only these many Lots of Gold is allowed to be bought by a trader..
2. Is there any restriction on the maximum number of trades that one can make on a Single day ? Could You Please advise.. Thanks in Advance..
1) Each commodity has a restriction on position limits, its best to check on the MCX site for specifics. 3 is there any alternate way to see previous data in lower time frame??? 3) Can you try chartink?